Six states with Karnataka in the lead are the major producers of sunflower in the country. Karnataka with a production of 3.04 lakh tonnes from an area of 7.94 lakh hectares followed by Andhra Pradesh, Maharashtra, Bihar, Orissa and Tamil Nadu are major sunflower producing states of India. In India, Sunflower cultivation occupies about 1.48 M Ha area with average yield 0.6 MT/acre. Sunflower production follows a systemic weather risk as about 80 per cent of the area is under rain-fed production. In terms of productivity, Bihar leads with 1402 kg/ha followed by Tamil Nadu with 1328.7 kg, although both the states have less than 25000 hectares under the crop which is mostly irrigated. The average productivity at all India level was 900 kg/ha depending on the climatic conditions and irrigation, which are critical factors for high yields. Syngenta uses cutting-edge breeding methods to develop high performing, multi-disease tolerant hybrids which are better for rainfed conditions. We do this through the introduction of best- in-class genetics adapted to different geographies and weather conditions. Globally we are frontrunners in sunflower thanks to our germplasm strength that leads to enhanced stability under stress. We are developing innovative hybrid seeds with high oleic content, to provide healthy choices for consumers. In India our hybrids like Sunbread 293 enable growers to do intercropping. Being a short duration hybrid it helps growers mitigate vagaries of the monsoon to a great extent while achieving higher efficiency of resources and risk minimization. S 293 has gained popularity and is preferred for intercropping with red gram in Karnataka & Western Maharashtra. Our new viral & multi disease tolerant hybrids like Armoni plus and S 2216 provide growers with assured yields. 1. 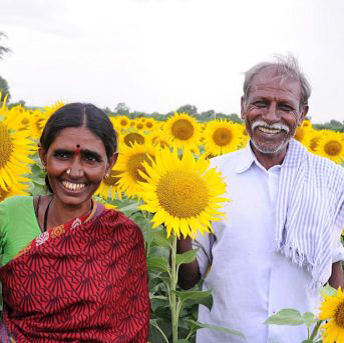 Lakshmi Devi toiled alongside her husband Venkateswarulu to profitably cultivate sunflower but incurred huge losses in the absence of proper irrigation and inadequate rainfall. Then she discovered Syngenta’s Sunflower seed varieties SB-275 and SB-207 with attributes like high oil content, earliness and tolerance to drought conditions. The family has been using these seeds for the past 10 years and have made enough money to increase their landholding by 5 acres in their village Peddapadu in Kurnool district, Andhra Pradesh. Five years ago Tirupathama and her husband M Swamulu, from Kurnool, Andhra Pradesh, were dealing with huge debts and could hardly make ends meet. Despite investing in sunflower cultivation for more than a decade they lived below the poverty line due to inadequate returns. In 2009 they started using Syngenta’s seed SB-207 along with its protocols for sunflower. They cultivated the hybrid on three acres of land investing Rs. 12000 in one season. Their net income was Rs 69,000 which was one of the highest returns in their village Chotukuru. The attributes of the hybrid like highest oil content, earliness of hybrid, tolerance to drought conditions and superior yields led to enhancement of their income. Five years on, they have saved enough money to lead a prosperous and tension-free life.